Buy Johnston's Underground Type from our US advertiser Barnes & Noble. »The Letraset Ripper is a free interactive online typesetter. It lets you colourise type and background. You can set your own headlines using any of the Letraset typefaces. Fontek Character Chooser is an easy way to locate all those accents, alternate characters, dipthongs, ligatures, punctuation, swashes and symbols that are part of most fonts. It's available as a FREE download. Character Chooser gives you instant visual display of every character in any font. You can preview, copy and paste directly from the pop up function window. Cool pen by ACME Studio, Inc. The lacquered brass body is perfectly balanced for comfortable penmanship. Capital Transport Publishing, in association with London Transport Museum have recently published a new book on the London Underground typefaces designed by Edward Johnston in 1915/16. The book, which retails at £14.95, has been designed and written by Justin Howes. "Johnston's Underground Type" is the first book to document Johnston's work for London Transport in detail. His other sans serif type designs for London Transport are discussed, and include the condensed Omnibus alphabets and a bold version of Johnston Sans. Also reproduced, for the first time, are little-known designs for silver medallions presented to the Underground's best kept stations, and a selection of his bullseye designs for London Transport. The author shows how Johnston's type emerged from his calligraphy at a critical moment for an Arts and Crafts Movement becoming increasingly engaged with the problems of industrial design. An excellent book that covers all aspects of the design development of Edward Johnston's Underground typefaces in great detail. 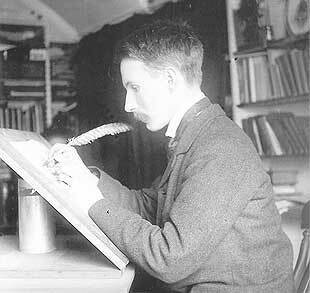 Edward Johnston, 1902. Photographed at Lincoln's Inn Fields. 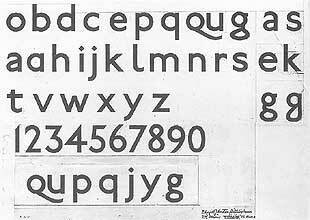 Finished upper-case design for Johnston Sans, June 1916. 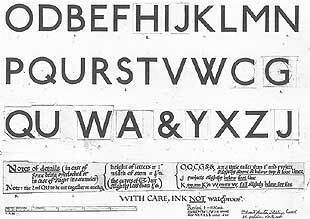 Final design for the lower-case, July 1916. Front Cover (designed by Tim Demuth from a London transport drawing). BLAM design is not affiliated with the authors of this page nor responsible for its content. PLEASE NOTE This web site is not affiliated with the Letraset company in any way. This is an independent site containing information about pens, typography and calligraphy. All images, characters, logos and trademarks are property of their respective owners and are used here either with permission or in an editorial fashion only.